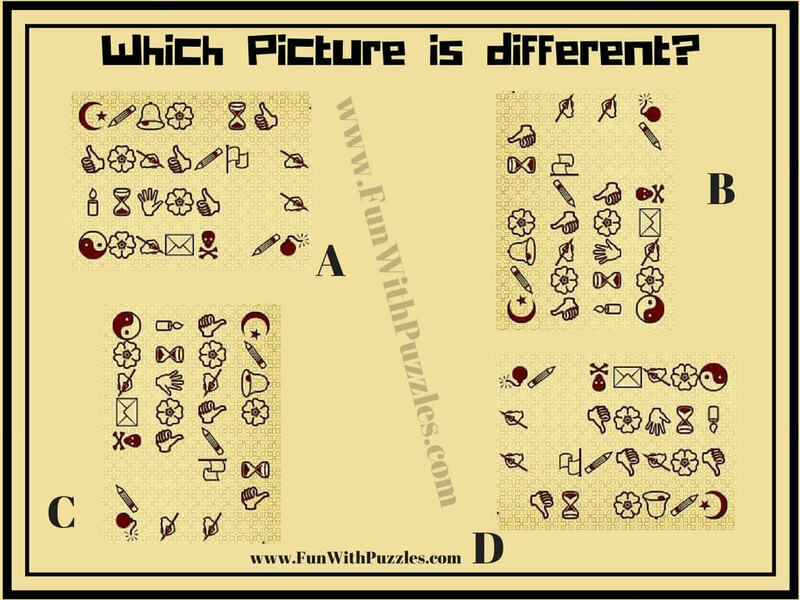 Picture Puzzles are very much liked puzzles on this website. In Picture Puzzles there are many different types of puzzles like Finding the Mistake Puzzles, Finding the Hidden Letter Puzzles or Picture Puzzles in which one has to find the hidden animals. Also there are picture puzzles in which one has to find the Odd One Out. Today's puzzle is Odd One Out Picture Puzzles. Image for this puzzle is taken from famous Code Breaking Game. In this Odd One Out Picture Puzzle, four pictures from famous Code Breaking Game are given. Three pictures from these four pictures are exactly similar. Only one picture out of these four pictures is different from other three picture. Your task is to find this picture image which is different from other three pictures. Scroll down to find out which picture is different from other three pictures! 1. Picture Puzzles for Teens With Answers: Here are many easy picture puzzles for teens. 2. Can you find the mistake? : It contains the picture puzzles in which one has to find the mistake in the picture puzzle images. 3. Mind Twisting Out of Box Thinking Brain Teasers with Answers and Explanations: These puzzles will twist your mind and will make you think out of box. 4. Simple Fun Brain Teasers for kids with Answers: Simple puzzles which are created by kids and for the kids. These puzzles will make you think like a kid.